“Not far.” All the while he’d been on crusade Henry dreamed of coming home. He left one war behind only to fight the absent king’s enemies in England. He would be the last to begrudge anyone of the recent truce, but he worried about facing his father and his desire to see Greyton diminished the closer they drew. Sheltered in the quiet of the greenwood he prayed the peace would last, though he wasn’t certain he would find it himself. Three years at war changed a man. Stephan had changed him. Stephan stretched his battled-honed muscles, but made no move to rise. His eyelids drooped. The man could sleep anywhere. In a siege camp, on a boat rocking on the sea, or on the hard ground. The slightest indication of trouble would wake him, a priceless trait for a king’s man in wartime, and one Henry had been grateful for from Outremer to Bavaria to England. Henry wanted to forget Stephan’s work for Queen Eleanor still loomed, their time together so uncertain. Drawing up on his elbows, he leaned close to Stephan breathing in the smell of leather, musk, and sweat. A gust of wind swept his dark wavy hair against Stephan’s cheek. Warm breath touched his face chasing away all thoughts of kings and queens, wars and traitors. He tilted his head to steal a kiss, but held back when the trees stilled and the wagon wheels echoed like distant thunder. Henry placed a finger to Stephan’s lips. “Quiet.” That wasn’t one wagon. He sat up, jostling Stephan and earning a grunt of displeasure. “Four,” Henry said, pointing to a fourth wagon lagging a bit behind the others on the opposite bank. A group of mounted riders passed in and out of the shadows headed north towards Lincoln. The chink of horses’ harnesses rang louder and dust and dirt stirred in the caravan’s wake. The riders wore hooded mail hauberks and black-as-night surcoats. Henry couldn’t make out their badges at this distance, but they were armed. Swords, shields, and clubs clinked against their mail chausses. Just three weeks past the truce had ended sieges across England. The king’s own brother had sought to usurp the throne. Count John’s treachery had been quelled for the moment, but John had many loyal vassals. The Sheriff of Lincolnshire, castellan of Lincoln Castle, was John’s man. If troops and provisions were en route to Lincoln, would this peace be crushed like grain beneath a millstone? Henry struggled to rise. His hauberk felt heavy, his bones remembering the ache of battle. Stephan offered him a hand and pulled him to his feet, embracing him tightly. Henry pounded his back. Reluctantly, they released each other, their eyes locking, no words needed. Stephan’s surcoat hung from a tree branch. He jumped a log to grab it, and then crossed the grassy bank to the horses. Sunlight painted his hair the hue of fresh-sown hay. Five months in England had faded the deep tan each man had worn in Outremer. Henry stared at Stephan as he dressed. “What have I done?” Stephan asked, his sky blue eyes sparkling with child-like innocence. Henry fingered his own linen shirt. “We may have a truce with the king’s brother, but if those are John’s men…” He pointed to Stephan’s clothes. Stephan looked at his surcoat and, with a wry smile, shook his head. “This will not do.” He stuffed all evidence of the king’s red and gold colors into his saddle pack. Wind rustled the trees. Sheep bleating in a nearby pasture did not hide the rattle and groan of the wheels on the cobbled road. Henry jerked his head. “They’ve turned towards Greyton.” Why? The one easy answer repelled him and fear crept into his heart. Surely his father did not play at Count John’s treason. “There is some reason for this,” Stephan said, reading his mind. Scrambling to his horse, Henry tried not to think the worst. He had one foot in the stirrup when hoofbeats echoed along the little-used forest trail where they had rested. He stepped away from Soleil, signaling Stephan to stay within the shadows of the trees. Stephan unsheathed his sword as two riders approached at a gallop. Henry reached for his blade, but the mounted men looked vaguely familiar. One sat as tall as King Richard in the saddle. The other was a head shorter and broad-shouldered. A branch caught his hood revealing a mass of light-colored hair. Emerging from behind a huge oak, Stephan looked more curious than concerned. “Where is Robin?” Their good friend Sir Robin du Louviers claimed he’d been ordered to hold a day with the squires at Windsor to await additional instructions from the queen. “You go on,” he’d said, one brow quirked knowingly. It had been a welcome ploy giving Henry and Stephan time alone. “We’d thought to rest—” Henry said. Stephan snorted, having enjoyed more than rest in the greenwood. He also knew full well Henry was not anxious to face his father. Henry turned a mocking smile on Stephan. The squires’ grinned, but he ignored them. “The wagons are making for Greyton. If they are John’s men, we’ll not look for trouble, but I must learn their business.” He mounted his horse as Stephan vaulted on to his dark Spanish stallion. They spurred the animals to the old stone bridge that crossed the Witham, slowing as the wagons came around the bend. Stephan halted, resting his fist on the pommel of his sword, his eyes on the guards. 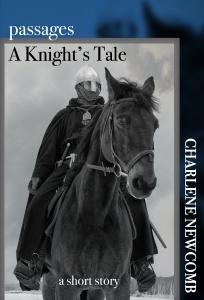 To either side of the knights, Little John and Allan sat straight in their saddles, their faces unreadable. The captain raised his arm signaling the wagons to stop. He looked young, his face unmarred but with strong cheekbones and dark eyes beneath black brows. He nudged his horse forward. Henry did not miss hands slipping round the hilts of a dozen swords. “You are traveling to Greyton?” he asked. Not Lincoln. But why stop at Greyton? A chill snaked through Henry’s bones. His horse sensed his unease and pawed the ground. Henry thought better of questioning the man further and stroked Soleil’s neck. Inspecting the cargo while it sat at Greyton should not be difficult. He’d arrange to share plenty of ale with the captain and his men to loose a few tongues. “I shall ride ahead and let my father know you are not far behind.” Henry heeled Soleil and gave him head before the captain could utter a reply. Pastures and fields of grain blurred past Henry. A few minutes later, he galloped into the village with Stephan and the squires at his back. Two small children chased a cat across the road directly in his path. His horse responded to the gentle tug on the reins and he skirted by them. Their arrival caused a stir, but Henry did not slow as villeins looked up from their work. Someone called out to him, but he reined in sharply and swung down from his horse, starting towards the timbered hall. Stephan chuckled and handed his reins to Little John. “I’ll keep watch on the road while you speak with your father,” he told Henry. The squires led the animals away as Henry took in his surroundings. A young boy peered at him from the stable door. Robin’s son. With this commotion, when would he have a chance to let Marian know that Robin was alive and at their doorstep? Henry did not know the whole story, only that Robin had left Marian without a word all those years ago. The war had kept Robin away, but had he known about the boy, he would have returned to Greyton. The village was much as Henry remembered. The chapel, the mill, a score of cottages and barns, animal pens, and workshops—still there and little changed while he had been gone. He acknowledged the smith sweating over his forge, but the fine reddish bay tethered outside the stables held his gaze. It had been ridden hard, its coat gleaming with sweat. A saddle cloth of rich crimson and jade graced the stallion’s back. From nearby Cartholme, if memory served him. Henry had met the baron once, but he had no recollection the man had ever called at Greyton. What business had brought him today, Henry wondered. He studied the weathered oak of the hall, the oldest part of Greyton Manor, built by his great-grandsire. His gaze strayed to the window of his father’s bedchamber, upstairs in the stone-built part of the manor. Edward de Grey had opposed Henry’s decision to take the Cross. Mayhap he had feared for Henry’s life—what parent would not? Oh Father, did you know war would force me to question everything I once believed? And love. Henry’s heart clenched. His father would never accept that two men could love each other. Never. And Henry would not tell him. Edward would be devastated, cast him from his land and his heart at any whisper of the truth. Henry had never imagined he would fall in love with another man. It had come after many prayers to God whose Church would condemn them, but he knew in his soul it was a rare gift he shared with Stephan. Their close friends recognized it—mayhap before they admitted it themselves. Henry took comfort they knew the truth. For exclusive news & offers, sign up for my mailing list. Somehow I missed this, Cathy! Thank you for reflagging. Great excerpt – great book! Highly recommended!